An ancient Chinese aphorism says that every dynasty starts with the replacement of an old, degenerate regime ruled by corruption and ineffectiveness. But as time goes by, new governors, in principle virtuous, come into the same vices and the so-called "Mandate of Heaven" (as they reign by divine gift) is passed on. In such a society, signs of the sky can greatly influence politics. The Ch'ing dynasty began in 1644, and achieved great splendor. By the mid-19th century, however, it started to become ineffective and corrupt. At this time, the British general Charles Gordon was charged by the western powers to help the Emperor of China and his dynasty in their fight against the Taiping revolt. Skilled with military genius and leadership, Gordon commanded an army of Chinese mercenaries and had many victories. 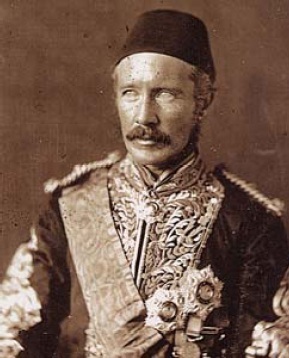 General Gordon in his uniform as Governor-General of the Sudan. Source: DigNubia - Exploring the Science of Archaeology. On November 25, 1863 CE, a partial lunar eclipse frightened his troops during the siege of Soochow (Suzhou) in Kiangsu (Jiangsu). The superstitious Chinese interpreted the event as a bad omen for the Emperor. Soochow was not conquered and the Taiping revolt was settled peacefully. The effect of this eclipse can thus be seen as a cause of General Gordon's first defeat. Another eclipse - solar this time - on March 16, was directly responsible for his death. In 1885, he was in charge of the defense of Khartoum, the capital of the Sudan, under attack by a charismatic religious leader, the Mahdi. A solar eclipse demoralized Gordon's troops. The city was taken before British troops could arrive with reinforcements and the British general did not survive the massacre. The Moon's shadow took some 20 minutes to cross Wyoming and Colorado, in the United States, on July 29, 1878. Considered one of the greatest eclipse events of that century, it is known as the great eclipse of 1878 for its large path of visibility. Many tourists filled hotels to see the spectacle - even the famous inventor Thomas Edison was there. Extensive preparations were made by officers in charge of the National Observatory to observe the eclipse. Five expeditions were assigned to observe the phenomenon and conduct relevant scientific investigations, such as making drawings of the corona, and to study the physical constitution of the Sun. 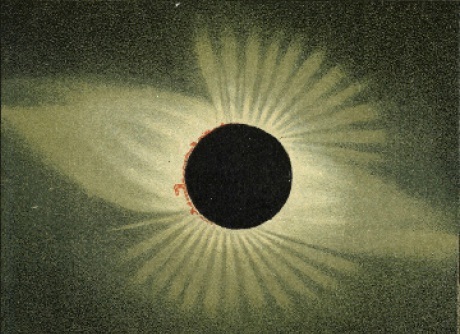 Although the corona was photographed in 1851, the results were not satisfactory and, in 1878, drawings provided the best information on its size and shape. Magnificent pastel drawing by E.L. Trouvelot of the total eclipse of Sun's corona during the 29 May 1878 eclipse. Credit: American expedition to Wyoming. From the E.L. Trouvelot, Meudon Collection. The 1878 eclipse was observed by the American astronomer Maria Mitchell, the first woman astronomer to join the prestigious American Academy of Arts and Sciences. She led a team of five of her students on a cross-country journey to Denver, Colorado, to observe and scientifically report a total solar eclipse. They traveled by train at a time when women did not travel unescorted. Her students were fascinated with the trip, although a little frightened. "You will see Nature as you never saw it before - it will neither be day nor night - open your senses to all the revelations", she pointed out. "Let your eyes take note of the colors of Earth and Sky. Observe the tint of the Sun. Look for a gleam of light in the horizon. Notice the color of the foliage. Use another sense - notice if flowers give forth the odors of evening. Listen if the animals show signs of fear - if the dog barks - if the owl shrieks - if the birds cease to sing - if the bee ceases its hum - if the butterfly stops its flight - it is said that even the ant pauses with its burden and no longer gives the lesson to the sluggard." The young ladies were enthusiastic about the experience and harbored a brave attitude at a time when women were not supposed to be inside scientific circles. At an epoch when men's colleges rarely engaged science students with direct field experience like this, Mitchell's students were entering a new era of learning for women. This event represented significant scientific, societal, and pedagogical advancement promoted by a pioneering woman.